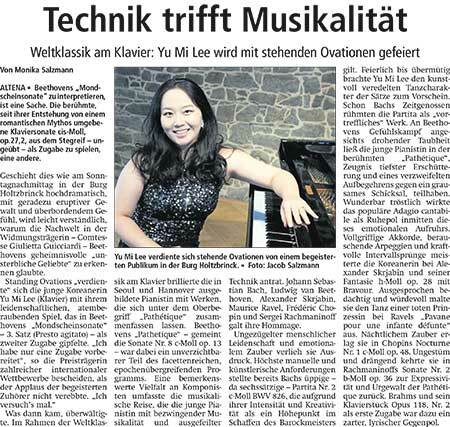 Please click on the picture in order to read the entire article: "Brilliant performing with sense of timbre and timing"
"The sound created under Yu Mi Lee´s hands has a rigor far from mechanics and a full, warm expression"
"Yu Mi Lee proved her power to lose herself completely in the works and emotions of their creators impressively. In her performance she combined intimate lyricism and fiery passion." "The extremely sensitive immersion into the works of six different composers showed her full range of technical skills, above all an intimate contentual connection at the highest stage." "Deep feelings spellbound in music! A moving musical experience." 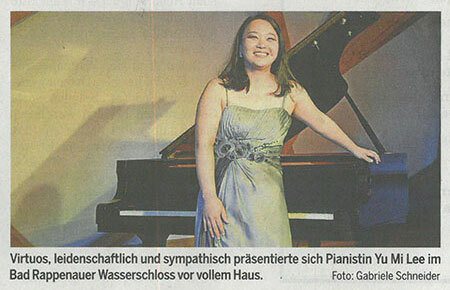 Please click on the picture in order to read the entire article: "Played and laughed into the hearts of the audience." "...floating through the hall with ravishing stroke technique and a beautifully metered dynamic range!" Please click on the picture in order to read the entire article: "As if from another world! ...the audience holds its breath almost incredulously. " 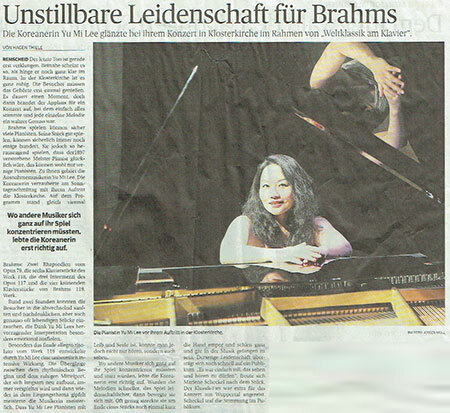 "Spellbound, the audience listened to her emotional, nuanced playing, which made the innermost strings sound out. " "Brilliant technique coupled with charm! 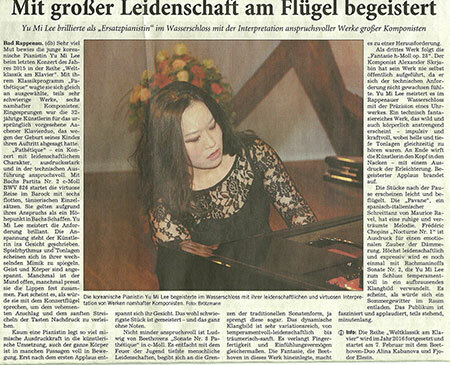 ... rang out in a depth of soul and expertly crafted beauty that only really extraordinary pianists can produce. " "An emotional Miracle! It seemed, as if summer thunderstorm fall into the hall." 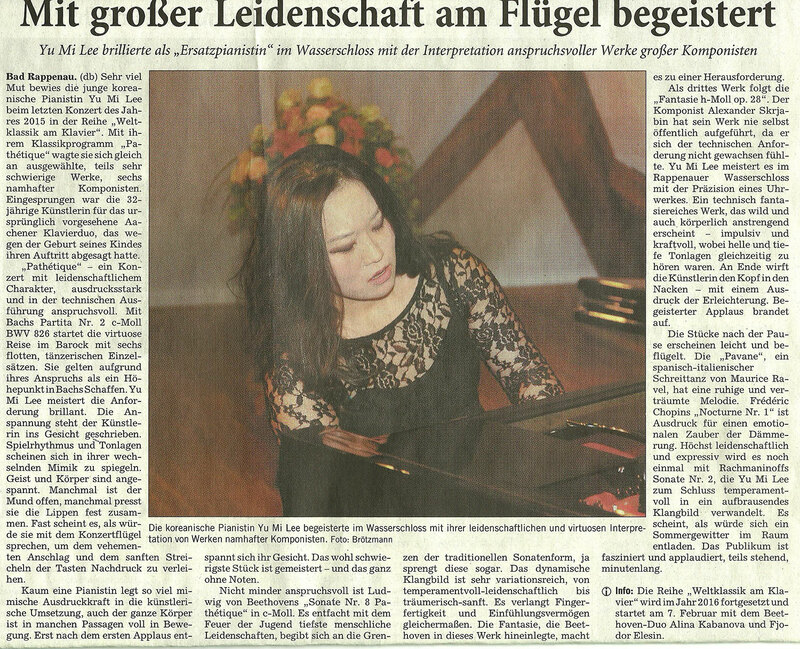 "A young pianist with irresistable musicality and polished technic! She expressed unbridled human passion - an emotional miracle." 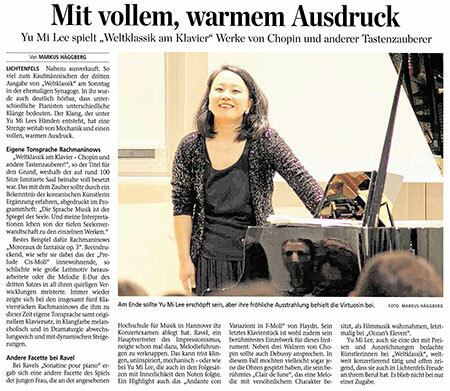 "An exquisite gem - Yu Mi Lee literally took her audience’s breath away"
"A charming musician with passion and an insightful sound!" "The tempestuous and torn music is often filled with anguish. The pianist is resplendent in her wild ride on the waves of an ocean ravaged by a storm. 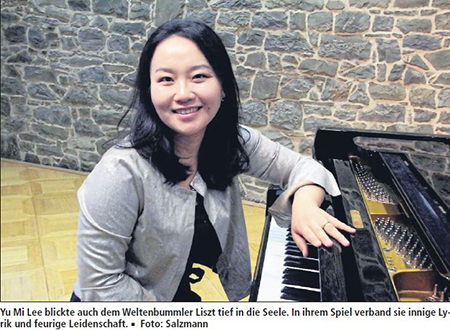 Highly focused, the music is clearly felt with every fibre of her being; in the end the pianist was also able to make music just from the stark contrasts." 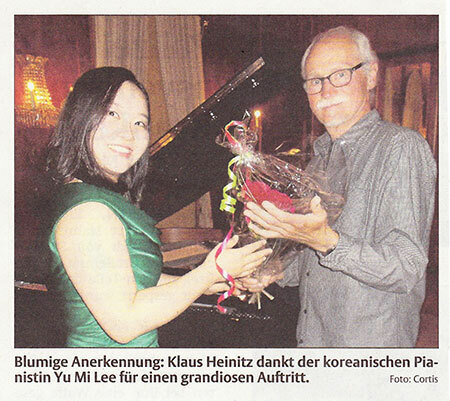 "The consummate musicianship of Yu Mi Lee is immediately evident in the vigorous, dynamic prelude on the Rappenauer grand piano. She plays very impulsively, but also with great sensitivity, which is highly apparent in the powerful, dramatic tones interspersed with quiet, gentle passages. Lee is a spirited player, but also allows emotions to shine through." "Many pianists can play Brahms. A few hundred can even play his pieces well. But only a select few musicians could play his pieces so outstandingly that the master pianist himself, who died in 1897, would be satisfied. 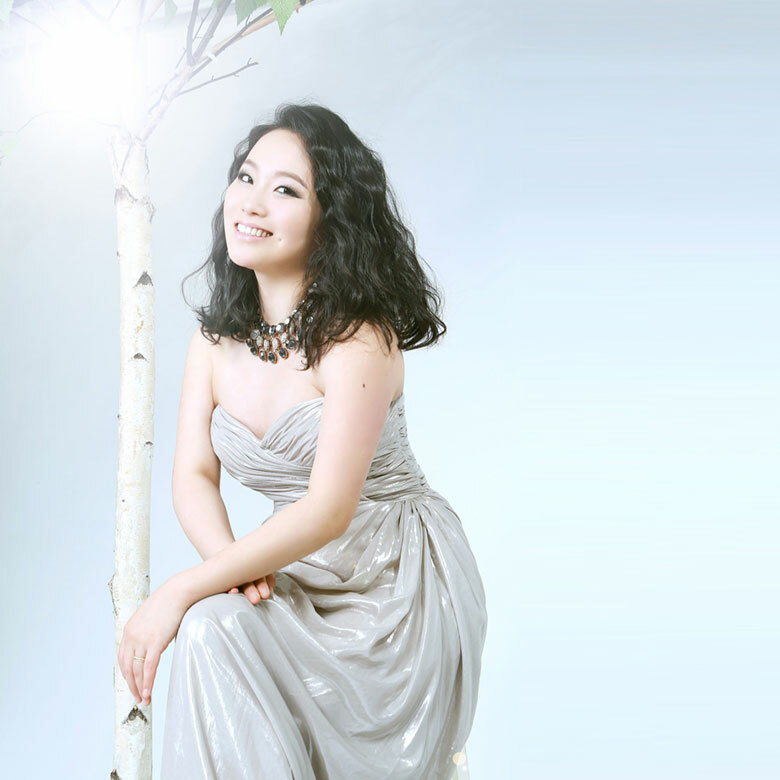 One of these few is the exceptional musician Yu Mi Lee." Her intelligent performance is endowed with intensity and communicative power. 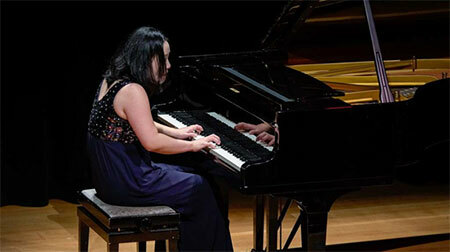 She is a highly gifted pianist with a great sensitivity and remarkable understanding of music. 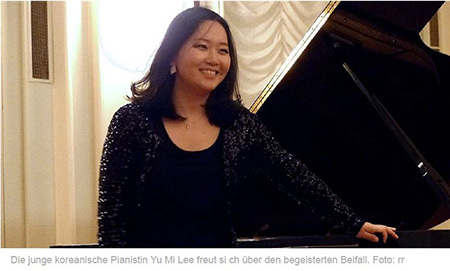 Yu Mi Lee achieved an extremely focused tone, resulting in an intimate rendezvous with the audience that became enraptured with the miracle of art – a moment as rare as winning the lottery jackpot. Piano playing at its best!